The best places to view Lake Havasu fireworks this 4th of July 2016 will be in various areas around the lake. Lake Havasu puts on a spectacular display each year that you don’t want to miss. Since this 4th of July falls on a Monday, many of us will get to enjoy a full three-day weekend. This will give you plenty of time to enjoy a ton of fun, entertainment and activities for the Independence Day Holiday in Lake Havasu City. And, when it comes to where the best places to view Lake Havasu fireworks are, I know some hot spots and the secrets so you and your family and friends can enjoy them to the fullest. If you are looking for a complete one-stop spot for entertainment, fun, food and fireworks, try out the Nautical Beachfront Resort. Details are first on the list below. Nautical Beachfront Resort – Celebrate your Independence Day 2016 in style at the resort with a VIP concert, which will feature the Eddie Joe Clark Band. The Eddie Joe Clark band will be playing many ‘Outlaw Country’ favorites on the Lakeside Terrace. You will also get VIP lawn seating for a front-row view of the amazing fireworks display. Rotary Park – A popular family gathering park that will have amazing views. You will be allowed to bring coolers and there will be free parking. However, there is no alcohol or pets allowed during the fireworks display. London Bridge Beach – Awesome views for the fireworks display and free parking. You can even bring your coolers on the island too. It fills up quick, so come early to claim your favorite spot. Thompson Bay – By far, the most popular place to watch the Lake Havasu fireworks. This is via boat only. Be sure to get there early since the lake will fill up quickly for the event. And, be sure to anchor your boat when you get to your favorite spot. The fireworks display starts around 9pm, dependent on setup and weather. And, you can listen to KNTR 980AM for a live simulcast with music specifically for the fireworks display. 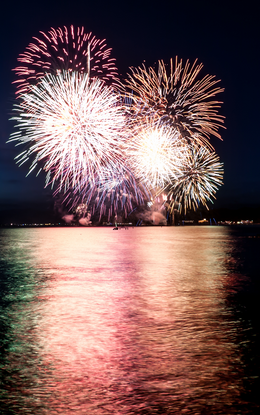 This information for best places to view Lake Havasu fireworks is brought to you by: Lori Dee Doerfler, For All Your Lake Havasu Real Estate Needs!